A request for snowboarding birthday cakes could leave even an experienced cake decorator stumped. As this isn't one of the most common birthday cake designs, it can be hard to figure out where to begin. Get some inspiration by heading to your local craft store during the winter months. It can be a great place to pick up some ideas for cake toppers. Helzer's Creations offers a personalized topper that can also serve as a holiday ornament. Wedding Collectibles has a topper of a snowboarding couple that can work for both birthdays and weddings. Once you have your topper picked out, it's time to start decorating your cake. To get started, bake a sheet cake of any size larger than 10 inches by 10 inches and let it cool completely. Once that's done, create a crumb coat of white buttercream icing using a rubber spatula. Your crumb coat should be about a quarter inch thick. 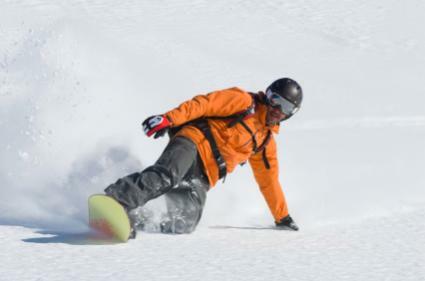 You want this starting layer so that your "snow" looks clean when you finish - perfect for snowboarding, instead of having cake crumbs mixed in with it. Bake a second sheet cake. This one can be smaller. An eight inch square cake should be fine. After this cake is cool, use a serrated knife to cut out jumps and ramps. Ice these items with light grey buttercream so that they will stand out on your cake. Place them in the refrigerator, on wax paper, for at least two hours. When you're ready to assemble your cake, stick the ramps to the top of it using white buttercream. If you need extra support, you can also use toothpicks. Just remember to remove them before serving the dessert. After you finish putting all of the items in place, ice the entire cake in another layer of vanilla buttercream. This time, you don't have to worry so much about it being perfectly smooth. The snowboarders were bound to leave some gashes in the snow. It's fine if the white and the grey mix together. You want a little of the grey to show. Finally, add your snowboarder topper or toppers. Then sprinkle the cake with a layer of white coconut or powdered sugar. Another option is to create a snowboarding birthday cake that looks like a snowboard itself. To do this, you will need your cake to be rather long and skinny. One way to create such a cake is to make two square cakes and set them side by side. Then, with some creative trimming, you will be able to make a snowboard. The bindings should be pretty easy to make using fondant. Remember that you can always simplify. Your snowboard cake does not have to be completely technically accurate for the birthday celebrant to be able to know that it represents a snowboard.